It is a scenic walk from Shifen railway station to the waterfall, with many choosing to extend the hike by alighting the train from Taipei at Sandiaoling and taking three or four hours to complete the Sandiaoling Waterfall Trail. To reach Shifen Waterfall, take the train to Ruifeng from Taipei Main Station and then transfer to the Pingxi Line, alighting at Shifen. There’s a small entrance fee to see the waterfall and it’s advised to check that it’s open before setting off as there have been reports of recent closures. Travel to Shifen in New Taipei City to experience the town’s two most notable attractions. First, visit Shifen Waterfall, the broadest waterfall in Taiwan known as “Little Niagara.” Then head into town to explore the Old Street, a bustling hub centered around the railroad tracks that were so important to Shifen’s coal mining history. Shop, release a sky lantern, and enjoy a few street snacks. Taiwan's Northeast Coast National Scenic Area is one of the country's most beautiful and best reputed; discover why on this day trip to Jiufen, Yehliu Geopark, and Shifen from Taipei. Travel with a guide and a small group of eight people or fewer to see the striking natural and cultural attractions of the region, including distinctive rock formations, waterfalls, and historical alleys lined with contemporary street food. This tour includes guided commentary (choose between Mandarin or English) and round-trip transportation from Taipei. Get off your cruise ship and away from the noisy, stressful crowds and visit two picturesque Taiwanese towns on this private, full-day shore excursion. Stretch your legs and walk down the old streets of Juifen, a mountain town in Ruifang District, and Shifen, in Pingxi District. Visit the tumbling waters of Golden Waterfall and Shifen Waterfall. Even partake in a traditional tiandeng (sky lantern) ritual, lighting a floating lantern, attaching your wishes to it and releasing it into the sky. Escape from the bustling city and discover the beauty of northern Taiwan on this 6-hour private tour. First head to the beautiful Shifen Waterfall, the widest in the country, before exploring the quaint railway town. After a stroll through the streets, head to Jiufen to try their famous street foods and take in the beautiful views from the Keelung Port. Escape to the Taiwanese countryside for a day, and don’t worry about logistics: this tour provides a simple, budget-friendly way to explore. Perfect for those with jetlag or who prefer a later start, this tour departs in the early afternoon. 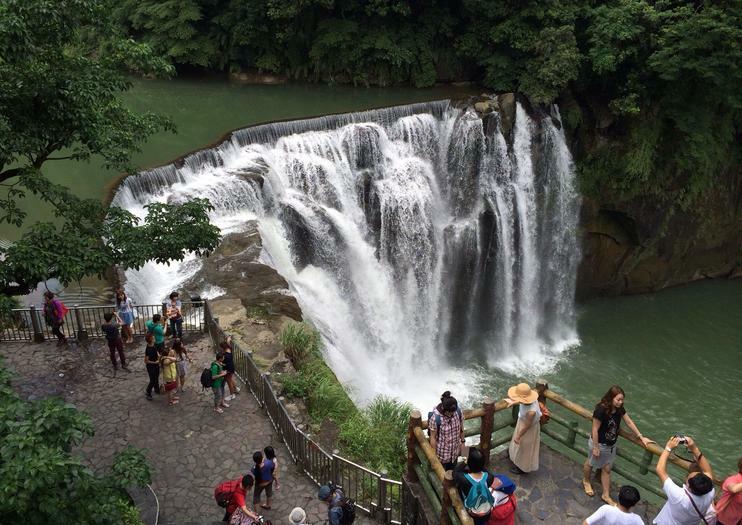 Admire Taiwan’s mountainous scenery, and stop by the grand Shifen Falls. You’ll also visit Shifen Old Street, where you can light your own sky lantern (own expense). Finally, head to Jiufen Old Street to browse, soak up the ambiance, and enjoy tea and snacks (own expense). Have you ever flown sky lanterns before? You will have an experience in writing messages on each side of lanterns before launching into the air. Travel from Taipei to Houtong Cat Village, Shifen Old Street, Jing Tong Station Railway Culture, Shifen Waterfall, and Suspension Bridge. Just a stone’s throw away from bustling Taipei, this tour will allow you to bask in the old-town atmosphere, take in beautiful scenery, and learn a thing or two about the area’s cultural heritage. See the northeast coast's fascinating Yehliu Geopark and the famed 'Queen's Head Rock, also visit the quaint hill village of Juifen, decorate and set off a glowing lantern at Shifen. Enjoy roundtrip shuttle transfer and plan your vacation! * [[ Join Tour Schedule ]]10:30 Ximen Station Exit 6 Left side11:20 Geology Park Sightseeing13:10 Move to Shifen14:10 Shifen tour Sightseeing15:10 Go to Golden Waterfall15:50 Golden Waterfall Sightseeing16:10 Go to the Golden Museum16:20 Tour after Arrival at Golden Museum17:50 Go to the Jiufen18:00 Jiufen Sightseeing 19:30 Go to Taipei City20:30 End Tour at Ximen Station exit 6- The above schedule is subject to change according to local circumstances.- Geology Park and golden falls may be excluded.- You can change the getting off zone when you join group opinion. * [[ Pick Up Information: ]]Meeting point: Ximen station Exit 6Every Friday, Saturday, and Sunday 10:30 ridingPlease arrive at least 10 minutes before departure. Skip the stress of navigating public transport and make the most of your time in Taipei on a private tour of Shifen Waterfall and Yehilu Geopark, the ideal choice for nature lovers with limited time in Taiwan's capital. Traveling with a private driver means that you can make stops whenever you see fit and customize your itinerary to spend as much or as little time at each stop. This is a private charter plan. We provide a personal driver whom can speak fluent English/Japanese to make sure that you can having no problem communicating with the driver. Uncover Northern Taiwan using a convenient private charter to visit the broadest waterfall in Taiwan, Shifen Waterfall. Light your very own sky lantern over the railway tracks of Shifen Old Street and sip on a Taiwanese tea in one of the many teahouses in Jiufen. With 2 hours of free time, you can go to visit famous touring spot in Taipei wherever you want. Such as Shilin night market, Raohe night market, etc.The free time is completely up to your choice! **please note that our driver is for pick up and drop off only, not a tour guide.